Help others and their organization recruit, manage, coach and organize their potential with GRI’s performance-driven approach to reach new levels of success. As a GRI Expert you are the person that leaders, HR professionals, teams and organizations rely on and turn to for growing and reaching new levels of performance. GRI Experts lead people and their organizations to accomplish great things, by doing even better what they already do well. GRI Experts learn the right approach, focused on helping people understand their talents, their best way to perform, and learn about the needs of their environment in order to better adapt, set, and achieve their goals and those of others. If this is what you are interested in doing, then it’s time to become a GRI expert. The GRI expert certifications give you access to a network of other GRI experts and companies, as well as new resources and continuing learning opportunities in GRI’s performance-driven system, surveys, online tools, and techniques. By transferring GRI’s power to others, you will experience a sense of empowerment and fulfillment, increase personal and team engagement, and advance in performance for growing their personal and team’s successes. Learn about the components of our comprehensive curriculum that prepares you to become an expert in performance-driven development and a GRI-Certified Performance expert. Learn how the GRI behavior profiles and a better appreciation of talent apply to people, their jobs, teams, and whole organizations. Make use the platform to analyze, learn, and share results with people you invite to take the GRI survey. Start becoming familiar with feedback and lead conversations on how to improve performance, fulfillment and success with others. Attending the GRI seminar comes with our training kit, which includes GRI’s manual, advanced access to GRI’s platform, GRI’s learning center, and support. After you have completed the seminar and experienced GRI beyond the training room, get certified by completing our online quizzes. Collect evaluations on your individual feedback and your contribution to teams or recruitments. You can then decide to become either an alliance partner to provide GRI services, or reach the consulting-level certification by first completing Step 3. With your new GRI skills in hand you may decide this is enough for now, or you may choose to reach the next level of GRI expertise. Attend the “Train Others to Fish” training, to learn how to train leaders, managers, and HR professionals and transfer to them the GRI knowledge and tools, and provide support. Acquire the knowledge to lead the transformational experience of the GRI trainings. Understand about adult learning. Learn to combine training, consulting and real case experience. After you have completed the GRI “Train Others to Fish” training, get certified by effectively sharing your expertise and GRI’s knowledge with others by delivering the GRI seminar and collecting evaluations and feedback. You assist organizations, their leaders, and teammates to lead a better life, achieve their vision in a culture that values diversity, and motivates people to excel at new levels. The GRI survey and what it reveals about you is really just the beginning. The real benefits beyond your GRI profile starts when you attend the GRI seminar, experience its transformational power, and when you take GRI’s mind-blowing potential to others and their organizations. With the GRI you learn how to educate leaders, managers, consultants, and HR professionals to help maximize their potential. You teach them how to recruit, perform, and reach new levels of success. You acquire the knowledge to assist them in taking GRI’s power to candidates, teammates, and many others in their organization. Make use of the GRI performance-driven approach to help people set and achieve their goals, and to understand and adapt to their environment when it’s needed. Allow people and teams to discover their talents, and how to remove unnecessary friction and work better together. Help teams discover and share their GRI profile, and develop and use their unique talents to improve their engagement and productivity. Help companies recruit the best candidates they need to achieve their goals and produce effective results. Help organizations and their leaders build a culture that recognizes and objectively values differences between people. Provide leaders, managers and HR professionals with GRI’s performance-driven system so that they can recruit the best, build amazing teams, and reach new levels of performance. 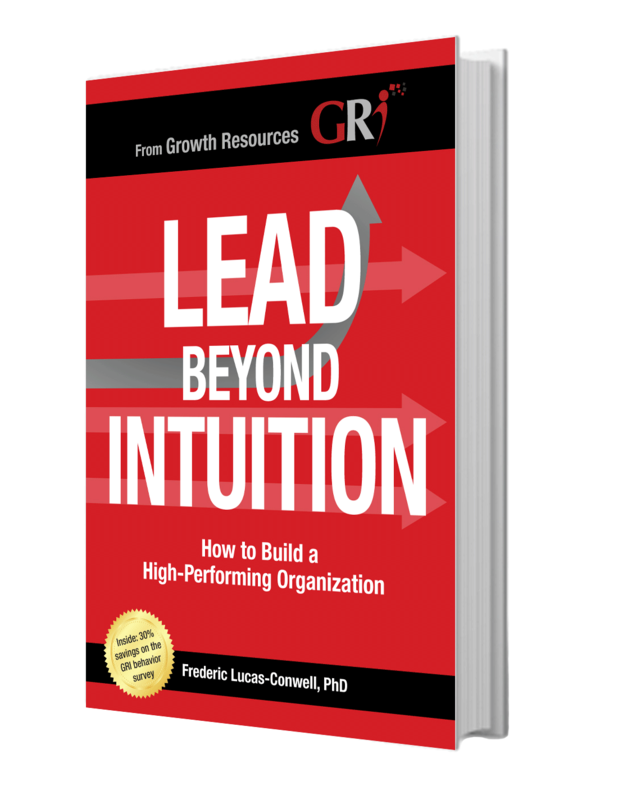 Lead Beyond Intuition: How to Build a High-Performing Organization introduces readers to the Growth Resources Indicators (GRI), how it uses data to assess behavior in the workplace and challenge people to rethink how they bring value to companies for the work that they do. Complete this form and Growth Resources will contact you about the best options for becoming a GRI Expert.